In the Nicene Creed Christians profess their belief in “all that is, seen and unseen”. 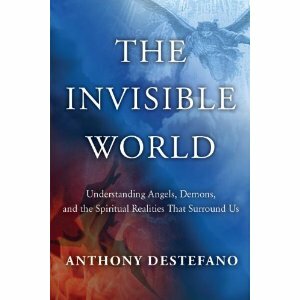 In his book, The Invisible World: Understanding Angels, Demons, and the Spiritual Realities That Surround Us, Anthony Destefano has written a guide book into the mysterious unseen world. His purpose in writing the book is to make the spiritual world more visible . Destefano asserts that readers will become more familiar with the invisible world and thus realize that it is a reality. The book is an easy read written in a conversational style. Still the author asserts that his arguments are based on “solid theology common sense and logic, and backed up by biblical scholarship and the universal teaching of the Christian church over the past two thousand years”. The book is well organized in ten chapters: The Haunt detector, the Invisible God, Invisible Helpers: The World of the Angels, Invisible Evil: The Devil and His Demons; The Invisible Soul; Invisible Warfare: The Diabolical Battle for Souls; Invisible Grace; The Invisible Power of Suffering; Invisible Destiny: Death, Judgment, Heaven and Hell; Seeing the Invisible. This is an excellent book for Christians who want to understand the spiritual world and are not inclined to read scholarly works. It is well written, and it is based on scripture and sound theology. As a Catechist, however, I found Destefano’s reliance on anecdotes frustrating. Further when referencing scripture and other sources, he usually does not cite his sources. For example, on page 50 ,in the chapter on angels , he correctly states that Scripture implies that every individual has a personal guardian angel, but he does not cite the verses. Consequently a reviewer on the books Amazon page, asserts that the author gets his theology on angels from “Touched by An Angel on the Hallmark Channel”. The scripture citations for the existence of guardian angels are found in the footnotes of the Catechism of the Catholic Church (paragraph 336). While the lack of footnotes or citations makes the book more accessible, omitting them is an obstacle to convincing those who reject the reality of the invisible world of angels and demons. Unfortunately, therefore, the author does not live up to his promise that his arguments are based on logic and solid theology and backed up by scripture and Church teaching. They are but the proof is not provided in this book. Caveats aside, I still highly recommend this book to believers who want to learn more about the mysterious world of the unseen. The author does indeed bring the mysterious world of the unseen to life. Disclosure: I was given this book by B&B Media group to review. There were no restrictions placed on me. This is an honest review. This entry was posted in Angels, Catholic, Uncategorized and tagged Anthony Destefano, Book review, Spiritual World. Bookmark the permalink.